As a member of the Melton family, you are rewarded for all your hard work with an exceptional miles based salary, tarp pay, benefits (for you and your family), as well as the bonuses and recognition you deserve. Best of all, we have freight that moves for 12 months out of the year. With such a large variety of commodities within our driver friendly network, Melton keeps you moving, mile after mile throughout the year. 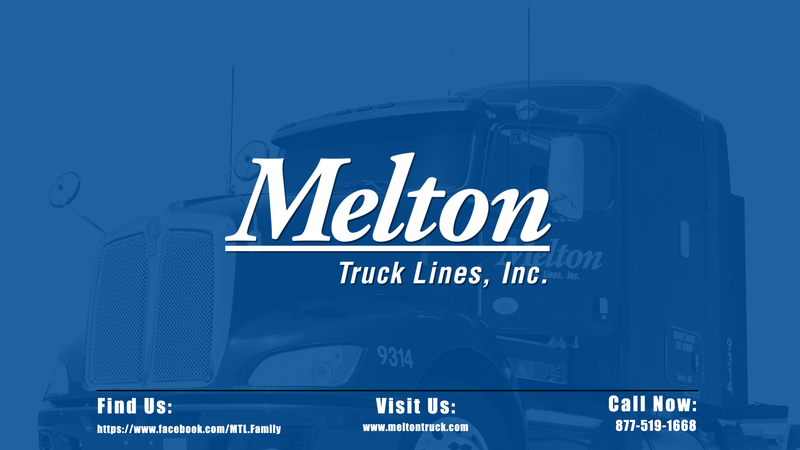 As a Driver for Melton Truck Lines, you will receive paid orientation, paid vacation, PRIDE Performance Bonus, Road Recruiting Driver referral bonus, liberal ride along program, extra stops, and more. All company drivers receive a full benefits package including health, vision, and dental insurance. Melton is dedicated to helping you ensure a secure future for you your loved ones with our 401(k) Matching Program. Over-the-Road driving can sometimes present many challenges. Melton is dedicated to the supporting you and your driving career with the various systems we have in place. Some of these systems include: The President’s Clubs, Lifeworks, ICARE Wellness Program, Safety Rewards, regular Driver Satisfaction Surveys, and much more. No Flat Bed Experience Is Needed To Join Melton Truck Lines! Must pass an integrity interview, meet Melton’s work attendance policy, and availability requirements.